4-6 Week Lead Time. Please consider the 100 GALLON NORWESCO WHITE APPLICATOR TANK if you need a faster option. 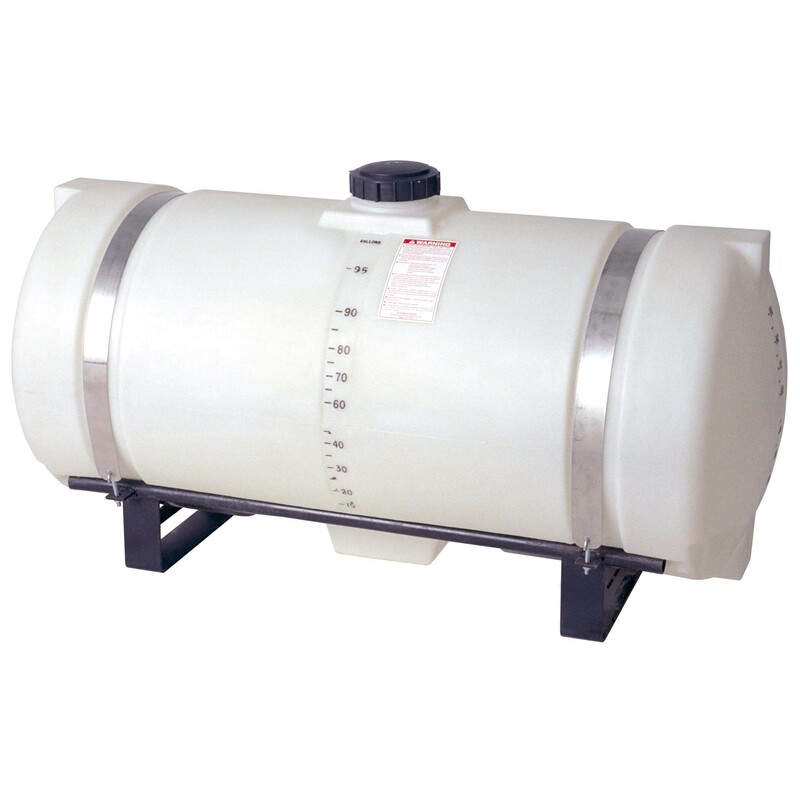 Ace Roto-Mold / Den Hartog 95 Gallon Applicator Tank, part# HZ0095-24, is a white plastic horizontal tank used for transporting water, fertilizer, and chemicals. This portable plastic tank was designed for a variety of applications and industries such as: full drainage applications, lawn care, agriculture, and everyday liquid transportation. It's constructed with seamless rotational molded polyethylene and has a 1.7 specific gravity rating. The applicator tank was created with FDA approved, food grade, virgin polyethylene resin - making it 100% potable and safe for drinking water. It complies with the U.S. Food and Drug Administration regulation 21 CFR 177.1520 (1) 3.1 and 3.2 for the storage of potable water. UV inhibitors give added protection against direct sunlight allowing for both indoor and outdoor use. The round design of this horizontal applicator tank allows it to provide full drainage. The tank comes with 1-1/4" outlet fitting located in the bottom center of the tank. It's also equipped with a 5" vented threaded lid. The applicator tank is transparent and contains gallon indicators for easily viewing liquid levels. This multi-purpose applicator tank is designed for storage and non-DOT regulated transport applications. Ace Roto-Mold / Den Hartog manufacturers this applicator tank in sizes ranging from 25 to 500 gallons. This horizontal applicator tank offers convenient liquid transportation with tried and true durability. Ace Roto-Mold part# HZ0095-24 is backed by a 3 year manufacturer warranty. The National Tank Outlet is here to help you with questions regarding this tanks usability and customization options.